posted the same source you did. And I discovered that quote is repeated verbatim all over the web. No research or studies mind you, just a quote from “the world's leading immunogeneticist”. Cough cough, oh yes. Can you say “argument from authority”? Nice find of that study showing vaccines reduce alzheimer’s too. I'm pretty sure that Maher had a face lift a couple of years ago. If so, it would seem that he's willing to accept Western Medicine some of the time. I wrote most of this up on Saturday and didn't check on your post again before posting my article. Can one say that Fudenberg was *de-licensed*? Not an "Altie" here, but in the last 25 years I have never had the flu shot AND I have never had the flu. Coincidence? Yeah, I noticed that too. I had also wanted to make a snarky comment that maybe Fudenberg was right about vaccines and Alzheimer's, given the general level of intelligence of discourse on the Larry King show. Maher seems to be suffering from paranoid personality disorder. His pattern of speech also indicates erratic thoughts. It makes me wonder what he's abusing, in addition to the admitted marijuana. I find it hilarious and sad that whale.to has an article entitled "Paranoid/Paranoia: Media Buzzwords To Silence The Politically Incorrect." A few months ago I did a check on Fudenberg's publications, and I noticed the same thing. Lots of papers a few decades ago, and then a trickle to very little. After reading about his mental health status which prevented him from getting his medical license back, I am wondering if he has not succumbed to some kind of neurodegenative disease. Possibly not Alzheimer's, but something else (perhaps similar to what happened to Nicola Tesla, who himself went from brilliant to bizarre). Thanks for taking the time to take what he said apart. I checked to see if Maher is one of the 98% of entertainment-biz folks who never graduated from college, and was surprised to find he actually graduated from Cornell. But his major was [drumroll . . .] ENGLISH (syn. Terminal Unemployability), so he need not be taken seriously about anything scientific, medical, or otherwise quantitative. Oi, doctor bud, having an arts degree does not make one an altie, nor does it make one ignorant of medical, scientific or quantitative subjects. Critical thinking skills apply and are taught across the academic spectrum, though some, such as Maher, miss that part of their education. What's Dr. Fudenberg's excuse? He seems to have emerged from your discipline. It may be fun to chortle into your beard about the so-called Terminally Unemployable, but let's face it, that's a cheap shot. Let's stick to legitimate targets for scorn, like those who insist that HIV doesn't cause AIDS (at the expense of their children) and those that fuel anti-vax paranoia. "Nice find of that study showing vaccines reduce alzheimer’s too." So they did a case control study and asked Alzheimer's patients to recall whether or not they'd had flu vaccines? That's pretty bad study design. I can't imagine how a flu shot would have any impact on Alzheimer's, except that it may make old folk live longer, and hence more likely to develope the disease. grad student hack said: "What's Dr. Fudenberg's excuse? He seems to have emerged from your discipline." http://briandeer.com/wakefield/hugh-fudenberg.htm which states "Professor Fudenberg plainly suffers from disability, and Brian Deer publishes this information only because he believes the public interest justifies the intrusion." Though the biography I read about him over a decade ago did not call it obsessive-compulsive disorder, OCD. But there may be similarities to Howard Hughes, who seemed to get worse as he aged. Fudenberg may have one of many mental illnesses that progress with age. I have no explanation for Mahar. Other than he is starting to get sucked into the cult of his own celebrity, and actually believes his own publicity. I would not attack his education, since my artist mother was probably the smartest all around person I knew (she explained number bases, like binary and octal, to me when got them in math). 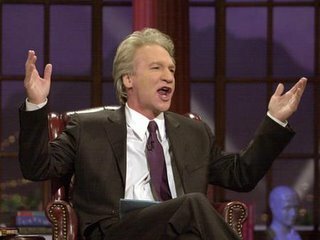 Bill Maher is not particularly funny, and he certainly is way past his, apparently temporary, reign as an A-List television personality-he was never quite a star. Now, having said that we quickly can get to the bottom of his wing-nuttiness. He is either seeking publicity by being contrary, or he is just one of those individuals for whom logical analysis and logical thinking is not possible due either to a poor education, a low attention span, or a low IQ. It seems to be difficult for some intelligent people to accept that intelligence is not required to be either active in or successful at show business or, for that matter, television news reading.